There are days when you partake in self-indulgence and cook an opulent meal for yourself and there are other days when you feel lazy. 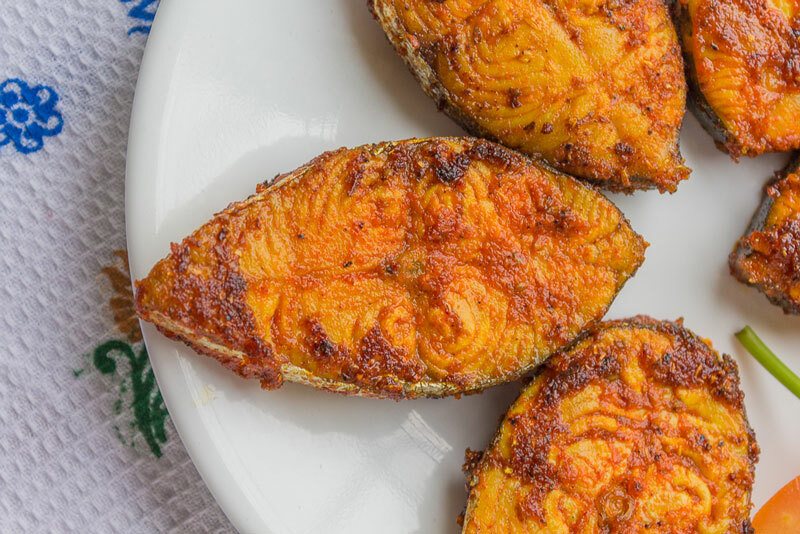 Once in a while, when I feel bogged down due to indolence I resort to some quick recipes that just lets me get done with my cooking ritual so that I could languish in my bed after lunch. Surmai Tawa Fry is an interesting recipe which strikes a fine balance between these two contrasting zones. At one hand it makes your guests feel delighted by its presence on the dining table, and it is simple enough that you could put together this dish in no time. I occasionally make it for my family for our Sunday lunch and accompany this with humble Dal-Chawal. Surmai or seer fish has been my first choice. It is a clean fish, and if you are an occasional eater of fish then possibly this should be your preference along with Pomfret of course. 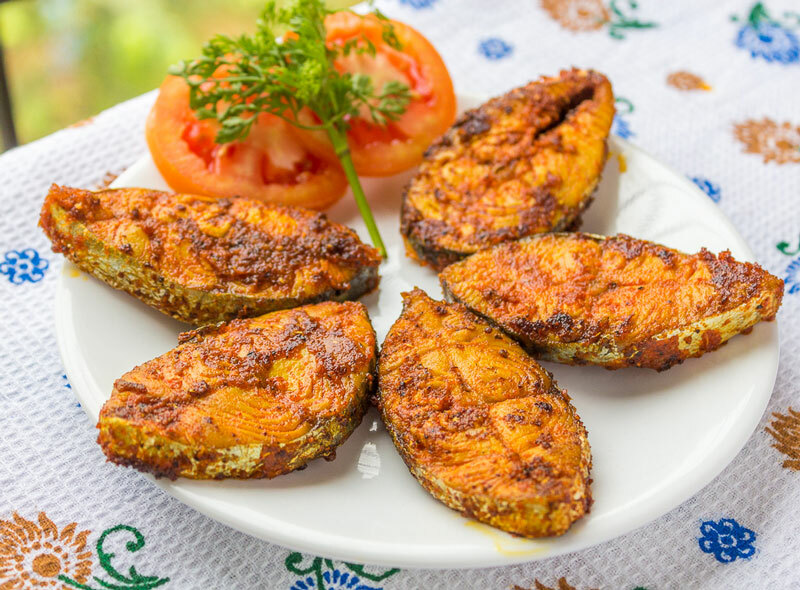 However pomfret takes a beating when it comes to cost and may cost anywhere up to 1000 rupees in city of Pune, whereas Surmai may come for half the price. Surmai is a fleshy fish, has minimal bones and hence occasional fish eaters can eat it without getting too cautious. 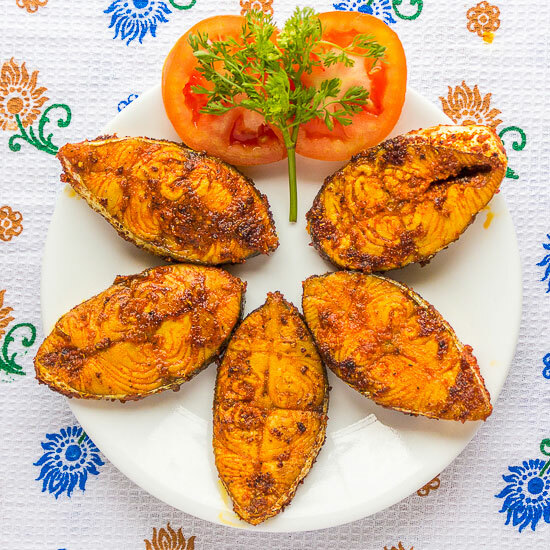 You can instruct your fishermen to slice surmai into fillets as per your preference. We usually ask him to make slant cuts of about half an inch thickness. This recipe is all about marination which plays a twofold part in this recipe. First marination involves lime juice which tenderizes the fish fillets. However, as the fish does not require much softening we marinate it for 10 mins. The second marination is more important as it infuses all the flavors into the fillets. Surmai has no taste of its own and it readily imbues the flavor of all the spices and other ingredients of marinade. After marination, fish is cooked for 4-5 mins from both sides on a pan smeared with small quantity of oil. As I said earlier, I like to enjoy Surmai fish fry with Dal-Chawal. It can also be relished with Rice flour Bhakri or Finger-Millet (Naachni) flour bhakri. Share your feedback about the recipe in the comment section below. 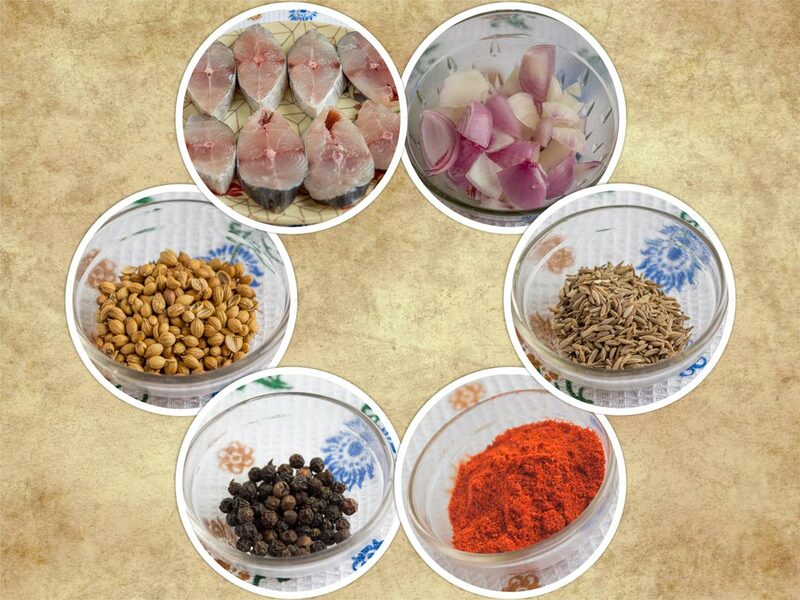 First Marination of Surmai (Seer Fish): In a large bowl, marinade fillets with turmeric powder,1/2 tsp salt, lime juice. Apply the marinade evenly on all the fillets.Marinate for 10 minutes. Put onions in a grinder jar,Add ginger-garlic paste, black peppercorns,red chili powder,coriander seeds, cumin seeds,curry leaves, 1 and ½ tsp salt. 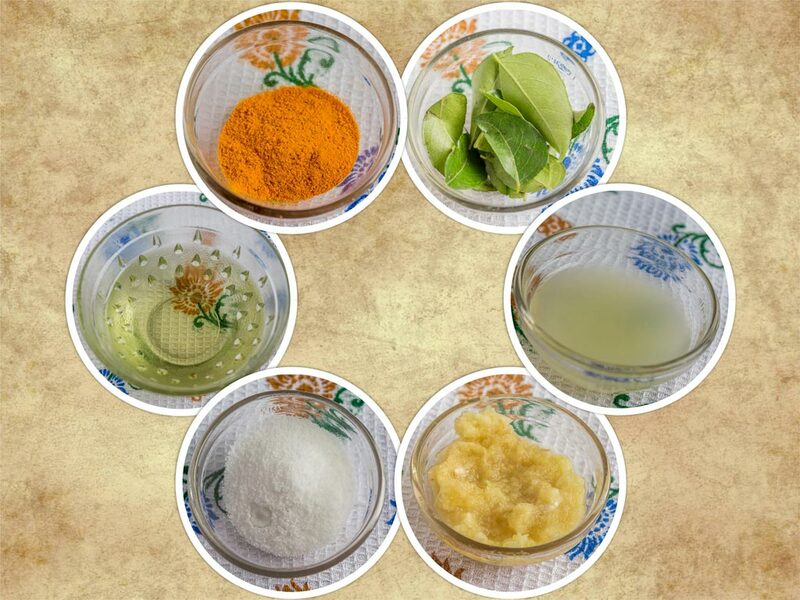 Make fine and thick paste which can be applied as a second marinade.Apply this marinade evenly on all the fillets. Allow the fillets to marinate for 30-45 mins.You can keep them in refrigerator. After 30 minutes of marination, remove the fillets from refrigerator. Heat 3 tbsp oil in a pan. Shallow fry the fillets. Cook the underside for 4-5 mins and then flip to cook from other side. When fillets are cooked from both sides, take them out from the pan. Fry all the fillets in batches. Surmai tawa fry can be relished with Rice or Finger Millet Bhakri(flat bread). « Tandoori Chicken- High school dreams!